In 1957, Justus F. Lehmann, MD, was recruited as the first Chairman of the University of Washington’s newly established Department of Rehabilitation Medicine. At the time, the Pacific Northwest had virtually no rehabilitation care for those with physical disabilities. Dr. Lehmann developed research, training and clinical care programs in medical rehabilitation. He established a residency training program in Physical Medicine & Rehabilitation, as well as divisions of Physical Therapy, Occupational Therapy, and Prosthetics & Orthotics. 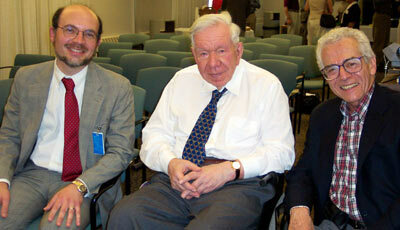 From left to right: Lawrence R. Robinson, MD; Justus F. Lehmann, MD; Walter C. Stolov, MD. Dr. Walter C. Stolov followed Dr. Lehmann and served as Chairman from 1987 to 1999. Dr. Lawrence R. Robinson was Chairman from 2000 to 2006. Dr. Peter Esselman is the current department Chairman. From left to right: Peter Esselman, MD; Walter C. Stolov, MD, Lawrence R. Robinson, MD. Opened in 1946, The School of Medicine is a nationally and internationally recognized leader in medical education, patient care, and scientific research. US News & World Report ranks us in the Top 10 Best Medical Schools in the nation, and first for Primary Care. The School of Medicine is the second largest in the nation with more than 1,300 faculty members, and serves as a regional medical resource for the states of Washington, Wyoming, Alaska, Montana, and Idaho. The University of Washington was founded in 1861 on a ten-acre knoll in what is now downtown Seattle, and moved to its present 660-acre site on the shores of Lake Washington in 1895. The University offers instruction in more than 200 academic disciplines to more than 34,000 students.